So what exactly is all this mobile optimziation business about? Like the twenty-three year old millennial I am, I obviously know, but do you? Shockingly, many businesses don't have a mobile friendly website, even some of the most unexpected ones. Learn more about this internet phenomenon and how to help your business' online presence be the best it can possibly be, while taking a blast through the past. Here's a little story that may shed some light over this unfortunate lack of mobile optimized websites situation for you. Over the holidays, I did most of my shopping on my phone while riding the ferry to and from work. Which isn't unusual, considering online orders linked to mobile phones this past holiday season generated over $110 billion dollars in sales. On this particular day back in December, I was on the boat minding my own business trying to find a decent gift for my sister. After browsing many different clothing sites, it dawned on me that she may like something from Brandy Melville, because who doesn't like any size fits oversized sweaters??? Then it hit me. The horror. An unoptimized mobile website. Not only is this BAD for any website, but it's REALLY BAD for anyone who is trying to immediately sell a product via their ecommerce webpage. Let's take a look. To the left here is a life-size image of an iPhone 6 portraying exactly what my eyes saw leading to such horror during that cold, demoralizing commute to work. See the text? Exactly. You can't. Well, that's the page menu, which is what you're supposed to browse around the website on. This failure of an optimized website is a huge no-no-no. Not because I'm an impatient Gemini, or that my boat ride is only 17 precious minutes that I could be otherwise staring at the cute boy sitting a few rows ahead, or that I was holding a coffee in my other hand and thusly couldn't use both hands to zoom in on my phone. Although those are all good reasons, it's a huge no-no-no because this is a prime example of bad user experience. 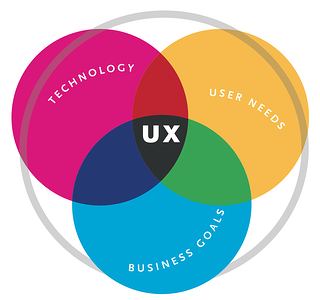 What's user experience? User experience (UX) is the overall experience someone has while using a website, especially in terms of how easy it is to navigate through content or how pleasing to the eye it may be. Brandy Melville, in this example, lacks UX. If I were to have spent time browsing that website then and there, I would have had to take my focus off of the cute guy sitting a few rows ahead, put down my coffee, and zoom in on every page I clicked on. By doing this, I would have be taking a completely unnecessary effort on my end in order to make my experience on that website a good one. As a company, you want consumers to have the best and easiest experience possible, doing everything you can in your power to make that happen. Do you expect your customers to come into your brick and mortar store and paw through piles of unorganized clothes? No. You neatly have your clothing stock on display to make your customer's experience a great one so that they, in turn, buy your products. So, if your website isn't currently optimized for mobile, stop and think about how important UX and your customers are to you. The first thing you should be doing if your website isn't mobile-friendly is starting the process of getting your site up to par with 2017 and implementing UX and mobile friendliness into your webpages. Bonus points if you take the time to read our previous blog post about Google's Mobile First Index change and how that relates to mobile optimization. 1. Using your phone to shop for clothes on BrandyMelville.com. 2. Going for your daily jog with a Walkman CD player in hand with one of those fresh Missy Elliot tracks playing. 3. Watching music videos on MTV. Or better yet, watching tapes you pre-recorded of music videos playing on MTV. 4. Sharing the cute pics you took from your vodka soda with extra lime filled Friday night by throwing a floppy disk in an envelope, popping a stamp on it, and dropping it in the mailbox to send to your BFF. 5. Enjoying a can of Surge. 6. Renting a DVD from Blockbuster. 7. Flipping through the yellow pages to find the number for that really cheap Chinese delivery place. 8. Pulling over on the side of the highway to break out one of those huge, folded over thirty times, almost impossible to fold back up the right way road maps because the MapQuest maps you printed out from your IBM 5150 Personal Computer somehow got you lost. 9. Hanging a giant Green Day poster in your bedroom. Now that that's over with, are you ready to leave the past where it should be? Great, welcome to 2017! Feel free to drop any questions or comments in the comment section below, then hop to it and contact Page One Web Solutions for help in getting your company one of the finest mobile-friendly websites from Timbuktu to Portland, Maine.